Allen Neal Jones is an American professional wrestler who has performed worldwide with various wrestling promotions under the ring name, A.J. Styles. He first took interest in wrestling after seeing his friends doing so and soon realized that he was pretty good at it. After being trained by Rick Michaels, the professional wrestling debut of AJ Styles came during 1998 when he began wrestling as Mr. Olympia in the Georgia based National Championship Wrestling promotion. He then rose to international fame through his brief appearance in WCW and later joined Total Nonstop Action (TNA) during 2002. He remained with the promotion for about 12 years winning the TNA World Heavyweight Championship twice and NWA World Heavyweight Championship thrice. Apart from that, Styles also joined Ring of Honor (ROH) from 2002 to 2006 where he held the ROH Tag Team Championship and ROH Pure Championship. He has also held the New Japan Pro Wrestling (NJPW) promotion’s IWGP Heavyweight Championship twice. Although A.J. Styles first appeared in WWE during 2202 but didn’t signed a contract with the company due to not agreeing on terms of development deal. But he was finally signed by WWE fourteen years later in 2016, making his return to the promotion at Royal Rumble pap-per-view that year. As far as his personal life is concerned, the wrestler has been married to schoolteacher Wendy Jones since 1995 and the couple now has four children together including one daughter and three sons. 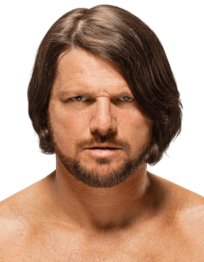 Following is the list of complete wrestler AJ Styles body measurements including his height, weight, chest, waist, biceps and shoe size details. The wrestler was raised in poverty. AJ Styles made his professional wrestling debut in 1998. While training at a wrestling school, A.J. Styles used to drive ambulance and mow lawns for income. He has a tattoo down the right side his torso (AJ 05-03-05 02-14-07 09-15-09) which represents the initial of his four children’s names and birth dates of first three.